You've probably eaten at seafood restaurants. Or a Chinese restaurant, then find the menu "steamed white snapper", right? Soaked with soy sauce, would you like to know? How he did What ingredients are there? To have a pleasant aroma and mellow taste If you want to know each other Anyway, come to the kitchen! Then steamed on boiling water for about 12 minutes. After 12 minutes, remove the fish from the crate. Then pour the water that comes out of steaming the fish away. Pour the vegetable oil in a hot pot. Turn on the stove in a middle heat. Waiting for hot oil. And then topped on steamed snapper. Hold the fish in the oil for about half a minute. you can use pan or hot pot add oil on middle heat. Let oil hot. add ginger and sliced of shittake mushroom, spring onion and red chili pepper in to the hot oil for a few minute and bring up. Then pour it on the steamed snapper. Arranged beautifully. 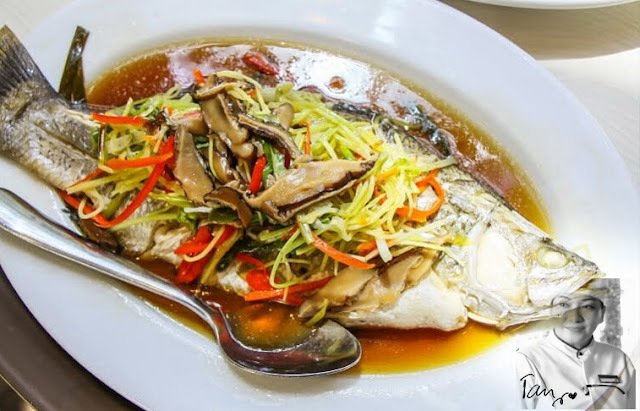 Just like this, you can make it easy with the "Steamed White Snapper with ginger and soy sauce" no spicy menu, guaranteeing that this recipe is made easy at home. Don't forget to try it out!